Wal-Mart documentary continues to be popular after 44 airings. Both times it aired earlier this month, the CNBC documentary “The Age of Wal-Mart” attracted larger audiences than any other business program on the network that week. That’s not particularly noteworthy until you consider that they were reruns. More than a rerun: The Peabody Award-winning film is two years old and CNBC has shown it 44 times. Television executives notice those kind of numbers, and the trend explains how Josh Howard got his job 10 months ago, running a newly formed documentary unit at CNBC and preparing the network’s first news magazine for its December debut. “It just tells you that there’s a real appetite for in-depth documentaries on people and trends (in business),” the CNBC president, Mark Hoffman, said. 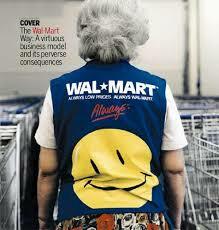 Where can I purchase the “The Age of Wal-Mart” dvd? I am very much interested in knowing how to get the dvd for “the age of Wal-mrt” for one of our Vocational teachers. How can we purchase this program? I don’t think it’s currently available on DVD yet. I’m sure Josh will post it there when it’s out. I can’t find it on DVD either but it is on google video search. I’m STILL trying to get Age of Wal-Mart on either VHS or DVD for a class I teach; I’m using a self-recorded copy and have to awkwardly fast-forward through commercials. Help! where can I purchase The Age of Wal-Mart on DVD? when is the walmart documentary going to be on tv again.